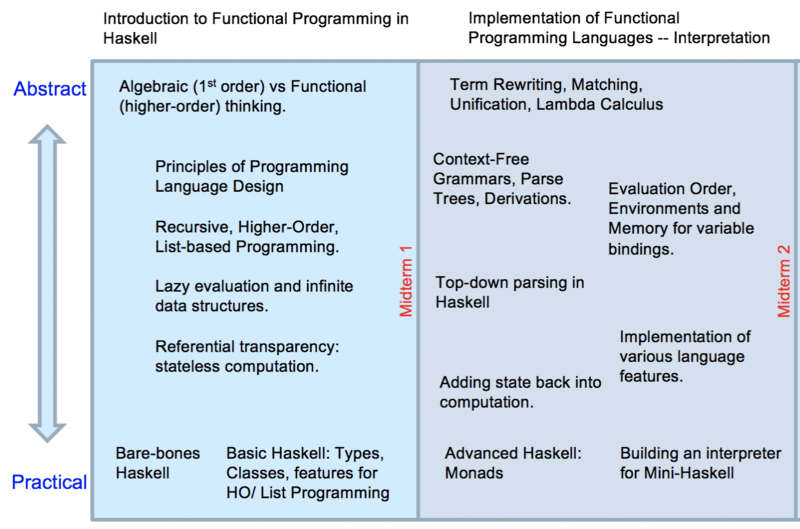 Administrative matters; Overall Plan for the course; Motivation: Why learn functional Programming? Reading: Hutton Chapters 1 & 2; also you could look at section 8.2 on data declarations (just for the basic idea; ignore anything you don't understand). Function definition by pattern matching; polymorphic types. Functions as first-class values; map and filter;lambda expressions; functions manipulating functions; modules. Reading: Hutton, Finish chapter 4. On modules, read HTML up to right before the section on Data.List. Typo fix in problem One a4 uploaded 2/10 11am. 6 M 2/11 Basic Haskell: Haskell built-in list and tuple types; Case expressions; Beta-reduction for lambda expressions and let expressions; HO programming continued: Curried functions; (if time) Function composition with currying. Curried functions, HO programming paradigms concluded: foldr; Type classes. 8 T 2/19 Virtual Monday! 9 W 2/20 Type classes concluded. Reading: Same as last time. Reread it! Video walk throughs of these two files have been uploaded to the YT channel linked at the top of this page, as well as a brief summary of my lecture. Video walk throughs of this file, and a two-part summary of my lecture have been uploaded to the YT channel. Video with hints on the homework has been uploaded to YT channel. 3/11 - 3/15 Spring Break! Implementing a functional language: Syntax, Context-Free Grammars, Parse Trees, Derivations; Parsing and Abstract Syntax Trees. Infinite Lists; Lazy evaluation in Haskell concluded. Dynamic vs lexical scope for lambda expressions. Read section 7.4 in Hutton on foldl. 18 M 4/8 Implementing imperative features: assignments, loops, and mutable state. 19 W 4/10 Review for Midterm 2; Discussion of final project. Semester Project Writeup in on gitHub! M 4/15 Tax Day: Holiday! 22 W 5/1 Conclusions and course evaluations.